Serbia, like most former monarchies of Europe, has had crowns once worn by its rulers. The various Serbian principalities and kingdoms were organised around a number of different royal dynasties. Many of these invested in symbols of royalty which has led to a number of distinctive crowns, jewels and other treasures of incredible wealth surviving to the present day. As far as is known, there are four royal crowns once worn by Serbian kings or princes that have survived to the present day, of which just one is kept in the modern Republic of Serbia today. The Nemanjić Crown Jewels are the oldest of the surviving pieces of Serbian royal regalia. They were used in the coronation ceremonies of members of the medieval House of Nemanjić. The 14th Century Crown of King Stephen III is kept at Cetinje Monastery in the Republic of Montenegro. Another crown which had once belonged to medieval Serbian rulers is kept in the Kaiserliche Schatzkammer (Imperial Treasury) in Vienna, Austria. Also, at the Kaiserliche Schatzkammer are found two further crowns once worn by members of the medieval Nemanjić dynasty; one of which was later attributed to Stephen Bocskai. Together with these is a golden mantle (buckle) of unknown origin which is believed to have been captured by the Serbs from the Ottomans at Brasov. The Karađorđević Crown Jewels were created in 1904 for the coronation of King Peter I. The pieces were made from materials that included bronze taken from the cannon Karađorđe used during the First Serbian Uprising. This gesture was symbolic because 1904 was the 100th anniversary of that uprising. The regalia was made in Paris by the famous Falise brothers jewellery company and is currently the only Serbian crown kept in the territory of the Republic of Serbia. 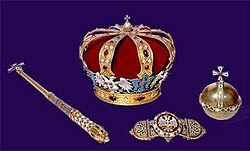 The crown, scepter, and orb are decorated with gemstones found in Serbia and enameled in the national colours of red, blue, and white. The royal mantle is made of purple velvet, embroidered with gold and lined with ermine fur. ^ a b c d Lazarević, Veselin. "(NE)SAČUVANA SRPSKA BAŠTINA". Vratiti srpske krune (in Serbian). Dan online. Retrieved 22 October 2010. ^ Fessler, Ignaz Aurelius (1815–1825). Die Geschichten der Ungarn und ihrer Landsassen. Leipzig. ^ "The Regalia". Royal Family of Serbia. Retrieved 2019-01-03. The globus cruciger, also known as "the orb and cross", is an orb surmounted by a cross. It has been a Christian symbol of authority since the Middle Ages, used on coins, in iconography, and with a sceptre as royal regalia. The Prussian Crown Jewels is the royal regalia, consisting of two crowns, an orb and a sceptre, used during the coronation of the monarchs of Prussia from the House of Hohenzollern. After the King of Prussia became German Emperor on the establishment of the German Empire on 18 January 1871, they were no longer used as the position of King of Prussia while still remaining, was a title of minor importance compared to the new role as German Emperor. There was no crown for the German Empire, although a heraldic version existed. The Serbian eagle is a double-headed heraldic eagle, a common symbol in the history of Serbian heraldry and vexillology. The double-headed eagle and the Serbian cross are the main heraldic symbols which represent the national identity of the Serbian people across the centuries. It originated from the medieval Nemanjić dynasty. The eagle, defaced with the cross, has been used in the contemporary design of the coat of arms of Serbia following the tradition established by the Kingdom of Serbia in 1882. The accession of the Serbian monarch was legitimized by coronation ceremony. The coronation was carried out by church officials.